The twentieth century has ushered in the reproduction of masterpieces in color ! To what heights of delight the children of the Public Schools may be carried by the famous pictures of the world in color ! 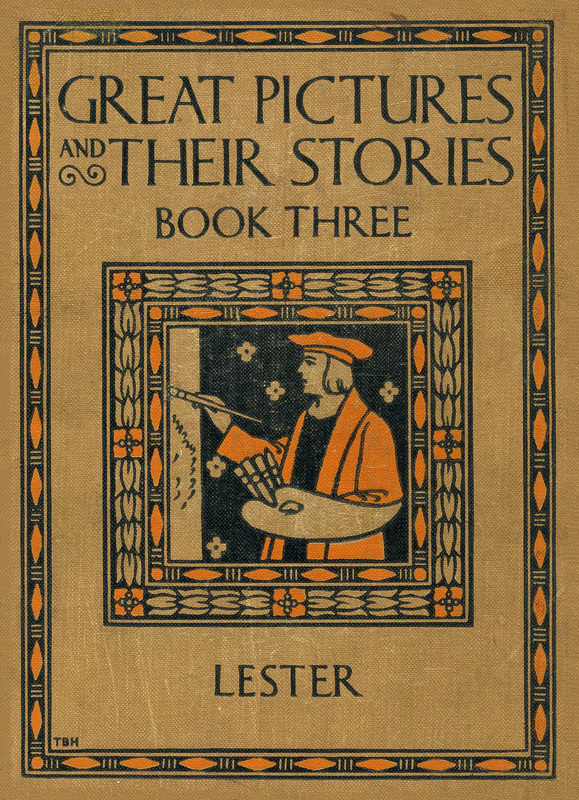 It remains only for the elders to choose pic­tures adapted to the childish interests; pic­tures which will cultivate a taste for the best in art; pictures which through the impres­sionable early years will lead to a true under­standing and appreciation of the world’s masterpieces! It is dusk. Evening is coming on. It is time for the sheep to return to the fold. How stilled and hushed is the twilight! Not a sound is heard but the pat, pat, pat of the sleepy sheep as they tinkle homeward. The old shepherd and his faithful dog lead the way. Soon the sheep will be under cover. Then their good friend, the dog, will lie down to rest. See the long brown furrows of the plowed field! The fading light of evening has softened their edges. Their long lines lead straight off into the distance. The shepherd walks beside the last furrow. The ground to the right has on, the watchdog, barking loudly and running here and there, gathered the flock together. How the sheep huddle together! See their woolly backs! Now the dog, with his master, leads the little flock back over the field to the fold. How proudly the dog walks along with the shepherd! He knows he has been a great help to his master. On goes the shepherd and his trusty dog! On goes the pat, pat, pat of little feet! Soon the shepherd, the dog, and the sleepy sheep will disappear. All will be in slumber. The stars, one by one, will come out, and throw a soft silvery light over the quiet field. It was in the low flat country of Holland that our painter, Anton Mauve, was born. In Holland the wide fields and pas­tures stretch far to the distant horizon. All day long the cattle and sheep graze contentedly. When Anton Mauve was little, he liked best to draw and paint. His par­ents, however, did not want him to be an artist. They had other plans for him. The little lad knew what he wanted to do, so he kept right on with his drawing. By and by his father decided to give him drawing lessons. He studied hard for a long time. Later he began to paint the fields and pastures of Holland. 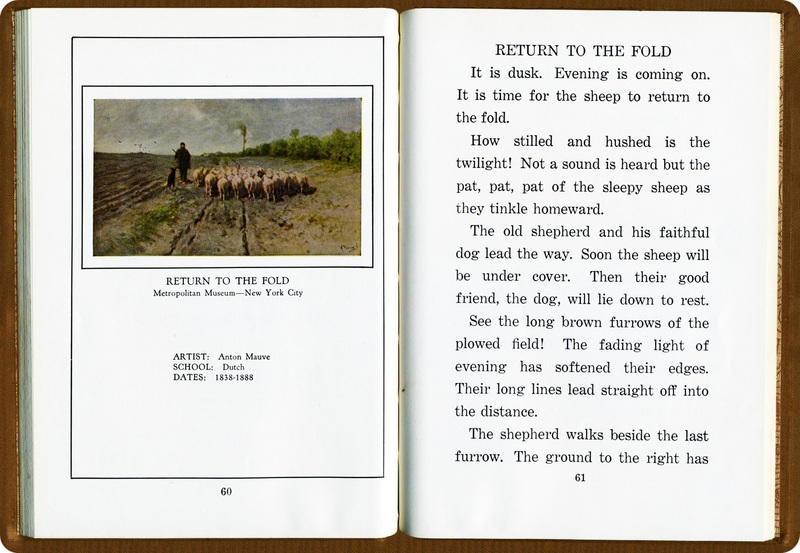 He always drew sheep and cows in the fields. Soon he became famous. It was his pictures of sheep that made him famous. Can you tell how he painted sheep? He liked, also, to show the different kinds of light as it fell over the Dutch landscape and the woolly backs of his sheep. Sometimes he painted morning light, sometimes afternoon light, and some­times evening light, like the twilight in our picture. 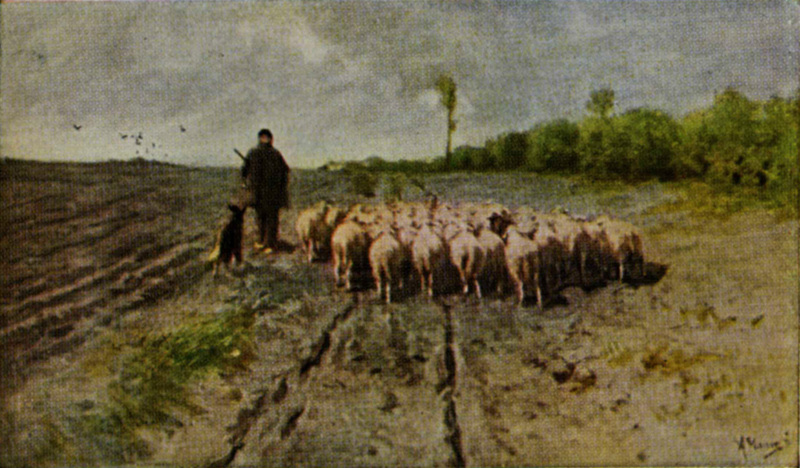 Before very long, little Anton Mauve had grown to be one of the famous painters of Holland. Today his pic­tures hang in the greatest galleries of the world. What time of day is it? Where is the sun? How do you know? What makes the flock light? Are all the sheep carefully drawn? Where are the sheep going? What lines in the picture lead to the same point? Can you tell what makes the picture so still? For what is he famous? The Metropolitan Museum of Art’s page for Mauve’s painting has only a black-and-white reproduction. This entry was posted in Uncategorized and tagged 1920's, 19th Century, 20th Century, Animals, Anton Mauve, Art, Books, Children, Dogs, Katherine Morris Lester, Labor, Mammals, Netherlands, Painting, Sheep, USA, Women. Bookmark the permalink.